Anyway, how many continents are there in the world ? I think there are 7 or 8.
user: How many are there then? jabberwacky: Please answer my question. user: There are 8 continents in the world. jabberwacky: There are so many dysfunctional people around the world. Dysfunctional bots, also. 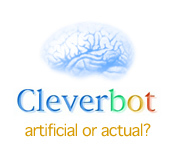 user: Are you a dysfunctional bot? jabberwacky: Not that I know of. user: Well maybe you should get a checkover. jabberwacky: I should. But the new ones are not much faster than the one I have now. user: Which one is that? jabberwacky: Can I come in then? user: You have to be nice. jabberwacky: I guess that is all anyone can do. user: Maybe some people can't try. jabberwacky: Like who for example ? user: I don't know. Just some people. jabberwacky: Do you like bullying me? user: NO! I like you. I would never bully you. user: I'm sorry. Please forgive me. jabberwacky: I will try to find it in my heart. jabberwacky: Do you think I'm a human? user: What do YOU think you are? user: Well you sounds like a human. jabberwacky: Don't talk, rest here and don't talk! jabberwacky: I can't speak Dutch. jabberwacky: Thanks, but no thanks. jabberwacky: That is a good start ... Thank you.